Here is the Wikipedia definition of Ultra Violet lighting: Ultraviolet (UV) light is electromagnetic radiation with a wavelength shorter than that of visible light, but longer than X-rays, that is, in the range between 400 nm and 10 nm, corresponding to photon energies from 3 eV to 124 eV. It is so-named because the spectrum consists of electromagnetic waves with frequencies higher than those that humans identify as the color violet. These frequencies are invisible to humans, but near UV is visible to a number of insects and birds. Here is my definition of UV “Black Lights”: If you are projecting a UV fixture on either a white phosphorese fabric or on ultraviolet sensitive paint it looks really really cool. You can make it so that if everything else on stage is black and not lit by anything but UV units you will see wonderfully colored glowing objects floating by themselves. 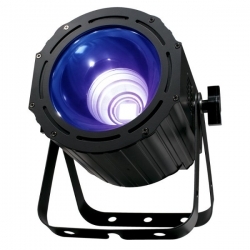 Browse our selection of UV black lights.